Even in Rome, one can fall prey to the common experience of not checking out the treasures in one’s own backyard (or underneath one’s feet, as the case may be). Underneath the Caelian hill, starting under the basilica of John and Paul, are a labyrinth of Roman houses, tunnels and other structures dating back to the first centuries after Christ. The Lay Centre residents were lead on a tour of the church itself and the Roman houses beneath by Fr. Augusto Martrullo, the Passionist priest who serves as rector of the basilica of San Giovanni e Paolo. We concluded the day with Sunday Eucharist in the chapel of the Passionist founder, St. Paul of the Cross, in honor of the Passionist Saint Gabrielle of Our Lady of Sorrows, whose feast it was. The Caelian hill was the site of the Temple of Claudius, which was raided for Nero’s Nymphaeum, which in turn was raided for the Flavian Amphitheater (Coliseum). On the edge of the hill were several houses known as insulae – blocks of apartments for artisans. At some point several of these were combined to create a single large domus – a house for the wealthy. This was thought to have belonged to the brothers John and Paul, who served as officers in the court of Constantine (c.312-337) and who became Christians, converting part of their house to serve as a domus ecclesiae – a house for the Church. During the reign of Julian [the Apostate] (c.361-363) they were martyred. The original church was built over the house by St. Pammachius, a Byzantine senator. It is a church, Padre Augusto says, whos history is one of constant renovation and reconstruction, having been damaged or destroyed during the sack of Alaric and the Visigoths in 410, an earthquake in 442, and the sacking by the Normans in 1084, among others. The most recent renovation was in the early 18th century when the entire church, which had been for almost 1400 years a great example of paleo-Christian architecture, was baroquified by the cardinal-titular Fabrizio Paolucci. Clearly considered a tragedy, this baroque “renovation” destroyed some of the ancient frescoes when a contraption was inserted that would raise and lower the monstrance during the new “forty hours devotion” that was becoming popular. It also destroyed the original design of the nave, cutting off light from the 13 high windows and turning the traditional five-aisle basilica into a single nave. It removed the altar from the center of the church (over the tomb of the martyrs) to a position in the west transept. Later, when Cardinal Spellman became the titular of the basilica after Pius XII was elected pope (thus vacating his previous titular church), he imported 33 chandeliers from the Waldorf-Astoria in New York to decorate the church (or so I was told by one Passionist; another disputes this origin of the chandeliers). Spellman also helped restore the façade of the church to the original Paleo-Christian look. It has remained the titular for the cardinal-archbishops of the “city that never sleeps” ever since, currently held by Cardinal Egan. 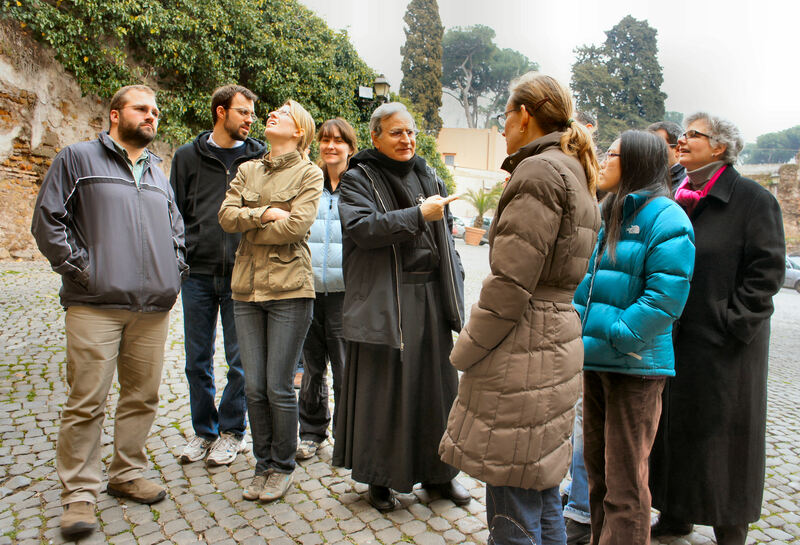 The houses underneath the basilica were discovered in 1887 by a Passionist Padre Germano. At the beginning of the 21st century, under Padre Augusto’s watchful eye, they have been restored and a new museum created, which opened in 2002. The museum now includes displays of first century amphorae as well as 12th century Arabic plates and pottery that had been used to decorate the bell tower added at that time. The rooms are in many cases well preserved, including some third or fourth century frescoes, including one that will be instantly recognizable to almost any student of church liturgy and history, a figure in the Christian orans position in a room full of pagan representations. Though currently off-limits, one can also see the entrances to various tunnels and other chambers which are thought to have served as training and barracks for gladiators, giving them access to the coliseum from underground. 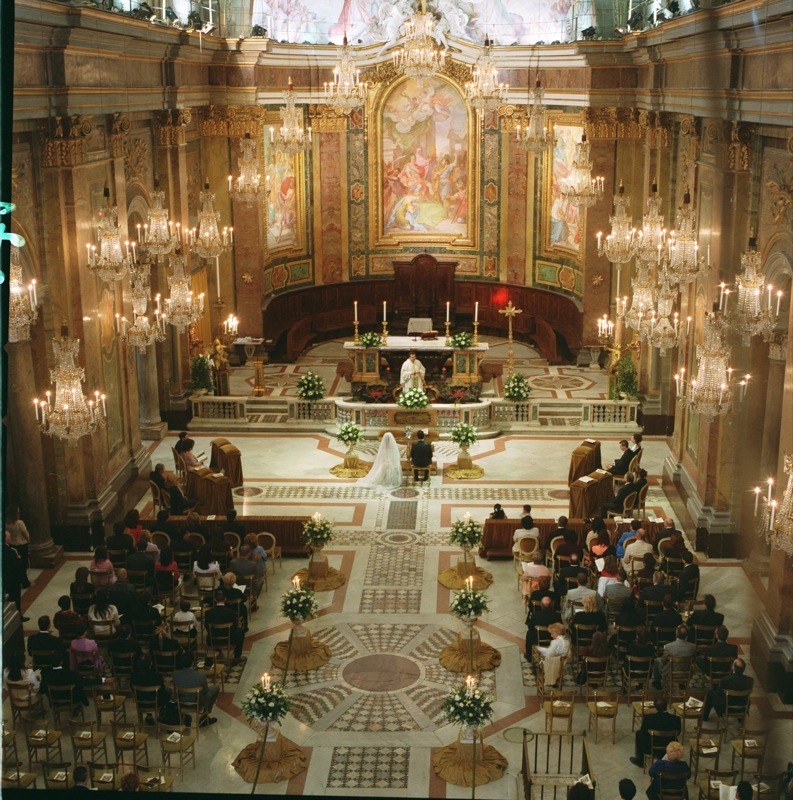 The basilica does not serve as a parish, but is a popular wedding location. The Eucharist is celebrated on Sundays by one of the Passionists in the chapel of St. Paul of the cross, with music by some of the Passionist students. 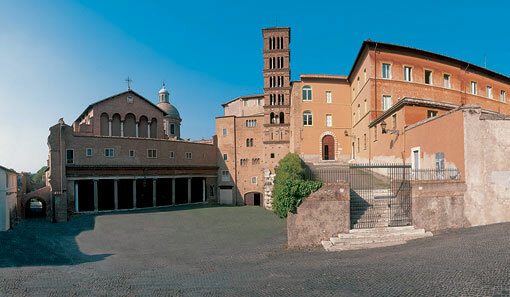 The piazza in front of the church remains one of the most well-kept examples in the city of medieval Rome, and has been used as a setting for several films and television spots. A small road along the side of the church, under the flying buttresses, is thought to be one of the oldest roads in Rome in continuous use as such. By A.J. Boyd in La vita Roma on February 27, 2011 .